When you think about failures in customer service and the impact of social media, you might think about the recent problems at United Airlines ejecting a passenger from an overbooked flight. But there’s another important example. We’re talking about a song written by Dave Carroll (now legendary) called “United breaks guitars”. If you didn’t see it, here’s a link to watch it on YouTube. The singer was able to wipe $180 million off the value of United Airlines back in 2009 when he escalated his customer service complaint, a broken guitar, by publishing a song to YouTube that was aimed directly at the airline. It was a shock for many to see just how easy it was for a public customer service compliant to take down an entire brand. He only resorted to this after failing to solve the complaint through traditional customer service channels. A lesson that is still very relevant today as research shows that at least 12% of social media complainants tried a different customer service channel first! Scottish Power is another good example of an organisation that discovered the importance of social media for customer service after implementing a new IT project. Droves of customers experienced problems with the new system, and so naturally contacted the customer support team. They were met with excessive waiting times and a poor end-response. It damaged the brands reputation and landed them with an £18m fine from Ofgem! Some enterprises have managed to survive and thrive delivering support on social. When O2 left 23 million customers without reception they received over 25,000 tweets of complaint. O2 responded honestly and with humour to every single tweet they received, which paid off, and in the process gained them over 13.5k new Twitter followers! It’s not straightforward for any enterprise to achieve, but effective social customer service has a positive impact on an organisations brand reputation and customer satisfaction. You download a free copy of our Social Customer Service & The Risks guide to learn more. In the Harvard Business Review article titled Your Company Should Be Helping Customers on Social, research showed that the under 35 age group spent almost 4 hours per day on social media, attributing this to a 2.5x increase in the volume of tweets targeted at brands in the last 2 years. Additionally, stats from McKinsey & Company show that 30% of social media users prefer to use social media for customer support instead of the telephone. Data from Twitter shows that 38% of organisations are either not set up to handle customer service enquiries on social media or choose to ignore them! This complacency is a threat to enterprises who need to be a little more proactive or risk failing their customers. We all know the good-old offshore call centres for customer service telephone support, and that many people loathe dealing with them. Some organisations have recognised this and now actively promote their UK-based customer service team as a unique selling point. Delivering good customer service requires a new kind of skill set – with unscripted spontaneity, Facebook English and cultural empathy, all required to drive social media engagement. The mix of skills required does depend on the type of relationship needed; at one end of the spectrum, Facebook English may be needed for short and sharp responses and at the other, more deep and meaningful rapport building skills. 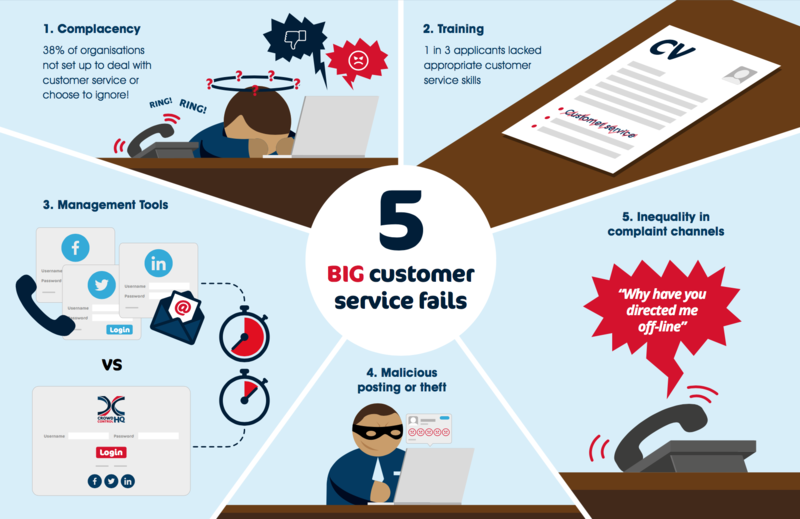 The risk here is that investment in social customer service training is either not recognised, or is simply difficult to achieve because resources have already been committed to more traditional channels such as telephone support. With different social media channels such as Twitter, Facebook and LinkedIn, it can be a challenge for the customer service team to deal with customers in a timely and effective manner every time on every channel. Just a couple of years ago it was not uncommon for teams to log in to each social media account manually and check for messages received. Perhaps they would take screenshots of difficult questions, send them to colleagues more knowledgeable on the topic, before receiving an email back with the answer. A time and resource intensive process simply to reply to a customer’s question. With a handful of enquiries this process was not seen as such a big problem, but with tens, hundreds or even thousands of enquiries it becomes a major barrier to success. Enterprise level social media management platforms like CrowdControlHQ help by providing a range of benefits enabling customer service delivery across all social media channels, and keeping a record of all conversations and customer cases as they evolve. The ability to automatically route conversations through to the relevant teams via effective social media collaboration creates valuable efficiencies by removing manual intervention as well as providing visibility overall customer service conversations. No matter what industry you work in, the need to spend time efficiently is paramount. Without suitable tools available to help identify and resolve customer questions quickly and efficiently, customers can be left waiting unnecessarily. No one likes to think that their employees could create a problem for the brand on social media but there are many cases of this happening. HMV is a great example, when a few years ago their social media manager took over the corporate Twitter account for around 25 minutes to give a blow-by-blow account of redundancies that were being made, using the hashtag #hmvXFactorFiring. The HMV senior management team had no ability to access the accounts, and the employee was able to score points against the company in a very public of way. This is just one example. With dispersed teams or staff members accessing corporate social media accounts, the challenge is to protect the brand’s reputation from rogue employees and at the same time allow customer service experts to access the required accounts. Customers are realising that they can often get a faster response from an organisation when using social media. A complaint or question that is publically visible on social media is more likely to be seen and resolved than those that take place behind closed doors. And some brands have been more open about this than others. Energy company NPower openly admitted to putting customer enquiries on social media at the front of the queue because they could see the direct link to customer retention. High performers in social customer service recognise it is a good opportunity to create value by cross-selling, up-selling, or reducing churn. ASOS is a good example of this as a brand that demonstrates a clear tone of voice when responding to customer queries on social with positive results. The good news for any social media or customer service leader is that these barriers can be broken to create an excellent customer service offer on social media that benefits the company and customer.